Still using a heavy rucksack while riding? If so, it is time to upgrade your motorcycle luggage. A motorcycle top box (also called hard tail bag or top case) is a good way to add lots of extra storage to your bike and keep items secure. The best motorcycle top boxes can be pricey investments though. Here’s what you need to know to get the best quality top box for your money. If you only need a small top box, you are probably best going with the Ryde 32 litre. For such a cheap top box, its construction and design are fantastic. For more space, it’s hard to beat the Givi Trekker TRK46N. 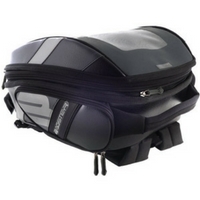 It’s got tons of space for all of your motorcycle gear and will even hold up against most amateur thieves. A lot of people hate motorcycle top boxes because they “ruin” the aesthetics of the bike. I’m a very rational person though and the practical benefits of top boxes outweigh the aesthetic argument. I think we may be overloaded! Yes – having storage is great, but it can cause some problems if you go too large. 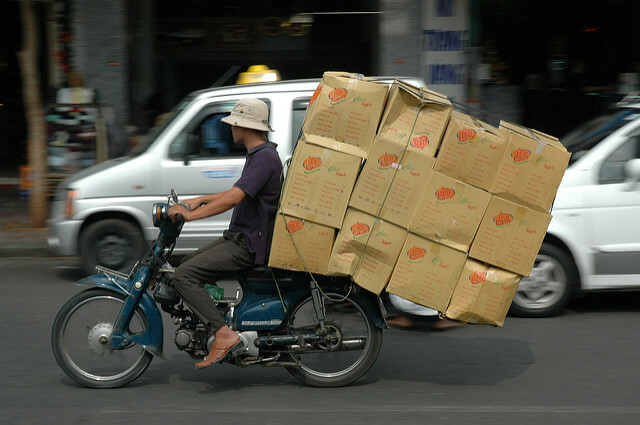 Overloading: People have a tendency to overload top boxes. Even the best top boxes have a max capacity of around 10kg. Too much weight can make your bike wobble and throws the centre of gravity off. Be careful! Difficulty Handling: Even empty top boxes will still add a lot of weight to your bike. If you have a small bike, are going off road, or go at high speeds, this can really affect handling. Damage to the Bike: If you really overload your top box, you could crack your rear frame. During off-roading, the stress from the top box can also break the sub-frame. In short, don’t buy a huge top box for a tiny bike. And (regardless of bike size) never overload your top box. 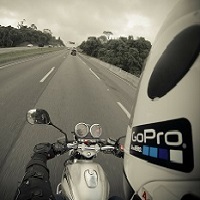 Motorcycle top boxes range from the ultra-cheap to expensive products by top brand names. Bear in mind that there is no one best motorcycle top box for all bikes. It depends on how you want to use it. For solo riders, this means getting at least 37 litres. If you have a pillion or armour on your jacket, you’ll probably need at least 46 litres. be aware that the shape of the top box can affect how much it will hold. An awkward shape makes it harder to get items inside. It’s easy to test how big of a top box you need. Just grab your gear and try to pack it up. Measure how much space it takes up in litres (I shoved my gear into a 50 litre cool box to gauge the size). Top tip: To get everything to fit in your top box, try this method. First lay your jacket into the top box with the zipper-side up. Make a “nest” for your helmet to sit in. Then fold the jacket sleeves up around the helmet. To fit a top box to your motorcycle, you will need to have some hardware. First you’ll need the mounting plate for the top box. This almost always comes with the top box – but check to make sure you don’t need to buy it separately! Then you will need a bike-specific mounting kit for attaching the plate to the bike rack (if you still don’t have a bike rack, now is the time to get one). I’ve heard of people using generic-brand mounting kits because they are cheaper than the bike-specific brand name ones. However, you’ve got to be careful about doing this. The generic kits don’t always attach well. You might end up with a wobbly mount. Top tip: Look for a top box mount which has a lockable quick-release feature. This makes it easy to remove your top box and carry it as luggage. One of the main benefits of top boxes is that they can be locked, allowing you to leave your items behind with the bike. It beats carrying a motorcycle helmet with you around town. Be warned that even the best boxes are still susceptible to theft. It only takes a teen with a screwdriver and some patience to separate you from your top box. That said, the best top boxes will provide some degree of theft protection. In the video below, you can see how a thief unsuccessfully tried to break into a Givi top box. The thief destroyed the lock in the process but luckily Givi makes replacement locks. 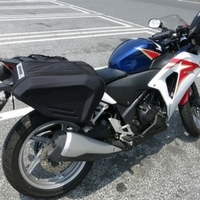 Givi’s boxes feature their patented “Monokey” or “Monolock” system. The Monokey system means you can use the same key for the lid and base plate. You can even match the lock to all of your other Givi Monokey luggage. This saves you the hassle of carrying an extra key. The Monokey lock is also much sturdier than universal mounts. By contrast, Monolock top boxes use a universal mount which can’t be used with Monokey luggage. You can’t reduce the number of keys required, and the locking mechanism tends not to be as sturdy. The difference is well explained in the video below. Buying tip: Consider whether you might accidentally lock the keys inside the box. Many top boxes can only be locked while the key is inside the lock, preventing you from doing this. I love brands like Givi for motorcycle gear. But, I also know that you can find seemingly identical gear by generic brands for a fraction of the cost. Read on to get the lowdown on our favourite products. Considering how cheap the Ryde top box is, it has a lot of impressive features. I guess it’s not too surprising since they seemed to copy the design from a brand-name. At 32 litres, the Ryde can still surprisingly hold a decent amount of gear including a full-face helmet and some extras. Compared to other cheap top boxes, the fitting system is very secure. It uses 4 hooks instead of the 2 that most cheap top boxes use. You have to keep the key in the cylinder to lock this top box, so there’s no risk of your keys getting accidentally locked inside. Note though that you have to push on the latch to lock the thing. It took me 10 minutes to figure that out! This is one of the most popular motorcycle top boxes by Givi. People mostly love it because of its cool opening and partitioning method. You can either fully open it on the hinge, or you can open just part of the lid – which is useful if you are trying to get small items out of the top box without spilling everything all over the road. I also appreciate that the key has to be in the cylinder to lock the top box. This way, you can’t lock your keys inside. Some people love the aluminium style of the Trekker case. I personally find it too boxy looking and don’t like how rain falls on it. It seems you’ll either love it or hate it though. If you aren’t ready to shell out a lot of money for a Monokey Givi top box, the Givi E300N is an affordable Monolock alternative. It is very cheap but still offers the reliability you’d expect with Givi products. At 30 liters, the top box will only hold 1 helmet and some small items. There aren’t any straps or pockets inside, so you’ll have to be careful when opening the case to make sure everything doesn’t fall out. Some people did report problems when trying to fit it to their bikes. However, Givi is a popular brand so you should be able to find bike-specific mounting advice online. The Givi Maxia has a 56 litre capacity, making it one of the biggest top boxes that you’ll find. You’ll easily fit two helmets plus some clothing and spare bits. It doesn’t cost much more than the smaller Givi top boxes, so it is worth it to buy this case if you need lots of storage. As you’d expect from Givi, the design of the top box is very nice. It has a document pocket and elastic belts for securing items. The handle folds right into the case. There is a hinge mechanism inside the top which allows the lid to stay open while you load it. The top box is easily removed so you can use the case like large luggage. My only issue with the Givi Maxia is that it can be locked without the key in the cylinder, meaning you could lock your keys inside. As a forgetful person, I’d rather not have this risk. The HOMCOM top box stands out for being incredibly cheap. Despite its low price, the top box is still built well. I haven’t heard of any incidences of it cracking or the lock breaking. As expected with a cheap motorcycle top box, you won’t get extra features or a thief-proof lock. The real issue is the size of the top box. If you have a larger full-face helmet (such as one with vents), it might not fit into the HOMCOM. Dimensions of the HOMCOM top box are 40(l)x38(w)x28(h). Measure your helmet carefully before buying this top box.